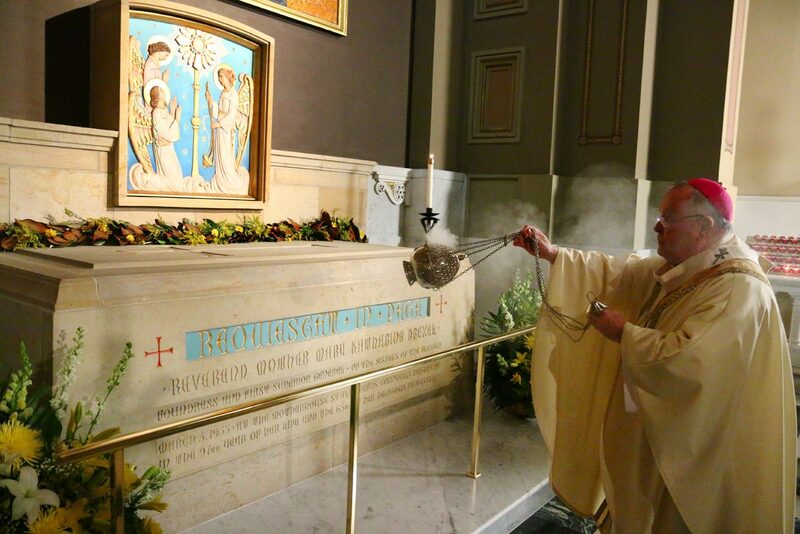 The solemn celebration of the installation of the tomb of St. Katharine Drexel at the Cathedral Basilica of SS. Peter and Paul was held last Sunday, Nov. 18 with a liturgy led by Archbishop Charles J. Chaput. 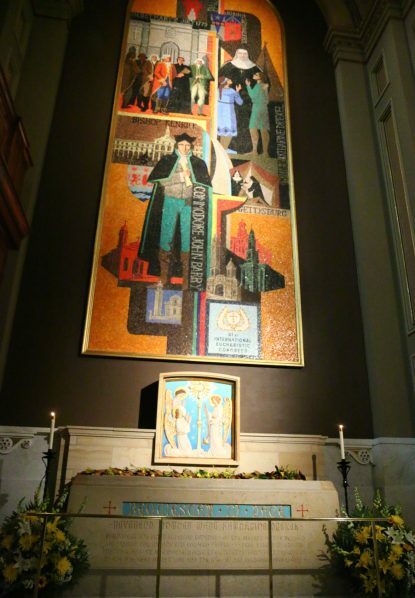 St. Katharine, who died in 1955 and was canonized in 2000, was previously entombed at a shrine beneath the chapel of St. Elizabeth Convent, the Bensalem motherhouse of the Sisters of the Blessed Sacrament. The congregation was founded by her in 1891 specifically for ministry to and evangelization of African Americans and Native Americans, the two ethnic groups that encountered the most prejudice in the United States. The transfer of St. Katharine’s remains was necessitated by the closing and proposed sale of St. Elizabeth Convent due to declining numbers of the Sisters of the Blessed Sacrament, as is the case with many religious congregations in this generation. Funding for the transfer was gifted by the Connelly Foundation, Philadelphia’s largest mostly Catholic-oriented private foundation. St. Katharine’s tomb, which exactly replicates its appearance at St. Elizabeth Convent, is now located along the left rear wall of the cathedral. It is adjacent to the Drexel family altar, which was erected in the 1880s by St. Katharine and her sisters, Elizabeth Drexel Smith and Louise Drexel Morrell, as a memorial to their late parents, Francis Anthony Drexel and Emma Bouvier Drexel who were generous benefactors to the cathedral. Also close by is the altar dedicated to Archbishop Patrick J. Ryan, who was St. Katharine’s close adviser during the early years of her ministry. Because St. Katharine was still a relatively young woman when she founded her congregation, the archbishop cited her as a model for young adults of our time. “Would that young women of the 21st century had hearts like her,” he said. Mother Katharine did not found the Sisters of the Blessed Sacrament alone, and “We pray that the example of your holiness today will attract more holiness,” he told the sisters in attendance. Native Americans and African Americans drawn for missions established by St. Katharine around the country were in attendance, as were representatives of various parishes dedicated in her honor. In her lifetime, especially before she entered religious life, St. Katharine was no stranger to the cathedral. Although it is bittersweet for the Sisters of the Blessed Sacrament and the community at large in Bensalem to have St. Katharine’s remains moved, it is generally recognized that having her shrine in the center of the city will result in many more pilgrims visiting. His brother, State Representative Eugene DiGirolamo, agreed. “It is sad that the body was moved from Bensalem, but it is appropriate that she should be here,” he said. Many other faithful visitors to St, Katharine’s Shrine in Bensalem were also at the Mass, for example Marie McGuirl, who credits St. Katharine with her cure from cancer in 1993. “I love St. Katharine, and I pray to her all the time,” she said. Francesca Corna, who was also at the Mass, was only introduced to Philadelphia’s St. Katharine recently. She is a student at Drexel University which was founded by St. Katharine’s uncle, Anthony Drexel. A fair number of pilgrims came from afar including Xavier University in New Orleans, founded by St. Katharine. The school’s concert choir sang at the ceremony. Also attending was Sister Nathalee Bryson, a Blessed Sacrament Sister ministering in New Orleans. Father Dennis Gill, the rector of the Cathedral Basilica of SS. Peter and Paul, would certainly agree. “This is a historic moment for the Sisters of the Blessed Sacrament, for the Archdiocese of Philadelphia and for our Cathedral Parish,” he said.